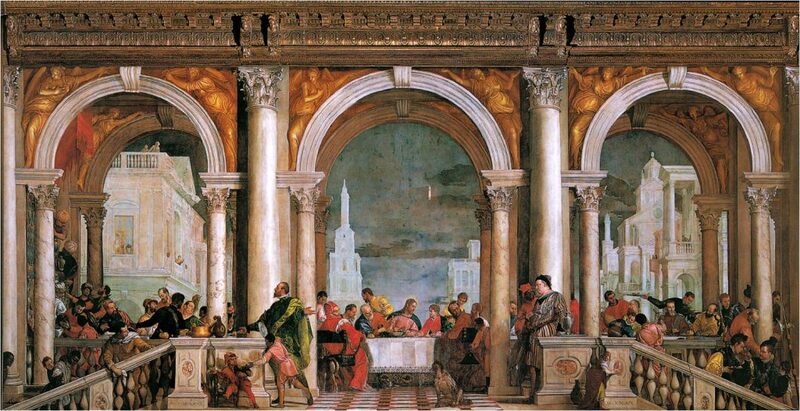 Paolo Veronese’s Feast in the House of Levi (1573). Ackeracy was initiated in response to an invitation to contribute to a memorial project for Kathy Acker and several other artists. I only met Kathy once, during a visit to the University of California, Santa Barbara, when she happened to be there teaching a course. Larry Rickels introduced us and the three of us went to dinner one evening. Larry and I were waiting outside the restaurant when Kathy rode up on her motorcycle, dressed all in leather. She looked the part of the persona she projected in her books, but in person she turned out to be quite different from the persona, although not without overlaps. She was one of the nicest sweetest people I have ever met and we had a great time that evening. When I started thinking about my contribution to the memorial I remembered that dinner, and associated it with Paolo Veronese’s Feast in the House of Levi (1573), which was in the genre of the Last Supper, painted for a Venetian monastery. The Last Supper theme probably triggered the memory, but also the scandal associated with the painting. Although the rule for such paintings was to portray only Christ and his disciples, Veronese’s version included over fifty figures, with such innovations as a dog and cat, and a German soldier or two. Veronese was brought before the Inquisition and questioned, and a transcript of this session survives showing how Veronese defended his interpretation. The Inquisitor demanded to know whether it seemed fitting at the Last Supper of the Lord to paint buffoons, drunkards, Germans, dwarfs and similar vulgarities. The title of the article puns on Acker’s name and the inquisitorial group known as Accuracy In Reporting. It was an obvious strategy in a piece about Acker to use her own method of appropriation and rewriting that she used in many books, my favorite being My Death My Life by Pier Paolo Pasolini. Veronese’s defense of his painting before the Inquisition provided a template of possibilities. I wrote a fictional transcript of the Santa Barbara dinner. By means of collage I brought together excerpts from an Acker interview with citations from various theorists and critics, as if they all were at the dinner participating in the conversation. The result is a reading of Acker’s work that also dramatizes her own compositional method. The exercise is related to a more general use of appropriation for critical purposes that I have talked about elsewhere as the academic remake. The original motivation for the remake was not the postmodern aesthetic but my research on the history of discourses on method, which showed that the poetics for new methods were often represented in forms borrowed from some practice discussed in the method, that at least partially performed the effect of the new poetics, to avoid the contradictory situation of having to use an existing method to express its refutation or alternative. I proposed an acronym for the generative formula I derived from an analysis of such discourses–CATTt, standing for Contrast, Analogy, Theory, Target, and tale. The appropriated form was the tale of the CATTt. Of course this tale was nothing like an entertainment remake, whose purpose is to reproduce the original in perhaps an updated version. No, the CATTt tale dumped the contents of the original and used the form as a vehicle for a body of insights that lacked its own genre or practice. In the academic remake this transformative and extrapolative procedure continues. The choice of text to be remade is motivated by some relationship to the theoretical argument whose language it organizes. Generalized beyond the purposes of poetics to other research goals, the academic remake retains enough of the original to evoke its aura or associations, but otherwise a commutation takes place in which the author replaces the original materials with the matter of his or her own question. I have tried this approach with Coleridge’s Kubla Khan, Nietzsche’s Genealogy of Morals, and Artaud’s The Theater and its Double, to name a few. Another way to look at the procedure is as the use of a singular work as if it were a genre. An important justification for this method is based on the postmodern, post-scientific epistemology that deconstructs the opposition between critical and creative writing. The justification for this deconstruction in practical terms is as an adaptation to the coming era of electracy (which is to digital technologies what literacy is to print). These new technologies, with the internet as their scene of publication, make it possible and necessary to compose with the whole page, so to speak. They are as much graphic as they are textual, and the network of nodes and links supports an associative reason and rhetoric that are best understood not through Aristotle but through Freud. To be an electrate person is to be as comfortable with aesthetic practices for text and image as a literate person is with argument and exposition. The Internet is a cut-and-paste engine for which the postmodern aesthetic of appropriation is the perfect rhetoric, at least as far as the academy is concerned. Obviously there will have to be some serious changes of attitude and policy regarding intellectual property, originality, plagiarism, and the rest of the ideological baggage of literacy before the schools will teach electracy, at least officially. Meanwhile, electracy is happening. Connie Samaras and Victoria Vesna (eds) (1999) TERMINALS.